I'm thinking it took a renewed humility in my spirit and the putting of my sufferings in perspective to finally defeat Paranoia, but I don't believe that covers the whole thing. 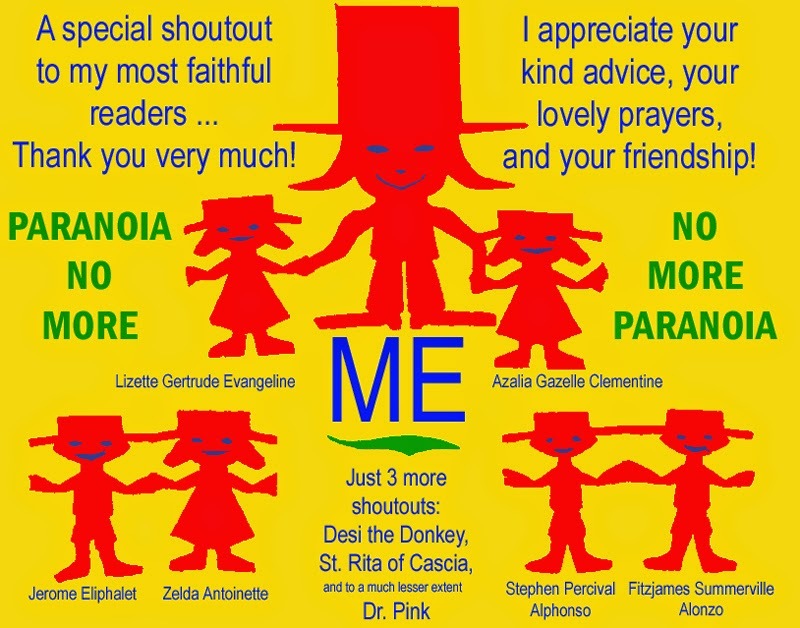 Certainly that covers much of what I got from the example of Desi the Donkey and St. Rita of Cascia, respectively. No one's more humble than a donkey who bears the Redeemer. And few have had the sufferings of the saint and yet zero in directly on the grace in it. 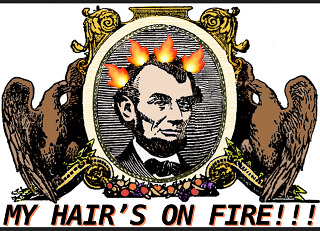 It wouldn't be hubris, surely, to say that I also have something innate -- or something accrued after years of life experience -- to help me find my bearings once again. If not, what is experience for? I can easily picture myself at a younger age in the same grip of Paranoia, making much more tentative, and, possibly, fatal moves. The Valley of Fire Snakes alone would have knocked me for a loop. Then, to have the wisdom well up as quickly as it did to avoid low places, valleys, gullies, bogs, moors, and fens, I think it would've taken longer. Whether I might have done it alone, though, there's no honest way I can know that. Not having done it, I'm not going to say I could have. A benevolent, watchful eye was over me the whole time, allowing those already named to help me along the way. I would add to them, to a much lesser extent, Dr. Pink, himself suffering, but from megalomania. Still, he's a man of science, and he's naturally enamored with his own theories, coming as they do from his incredible volume of research, his impeccable brain, and an ego that never quits. 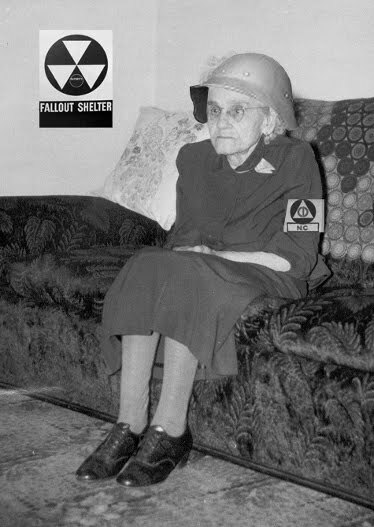 May I say, my experience with Paranoia this past week was, frankly, nothing new. I say that, but of course there's always something new about it. Whereas I've had a lot of Paranoia in my life -- perhaps more than my fair share -- it's still something I never seem to exhaust. Paranoia's many dimensions are wondrous to behold, always presenting novel twists on its enduring themes: The World 's Against Me, Enemies Are Endless, and, Something Secret's Always Afoot. Thankfully -- at least I've found this in my experience -- there's always hope. Hence, the Redeemer figures, and the many lifelines they threw me. One of the enduring images in mythic thought, descriptive of the variations in life's possibilities, is the Wheel of Fortune. You see it in the Tarot deck. Around and around it goes, landing today on Life, and tomorrow Death. 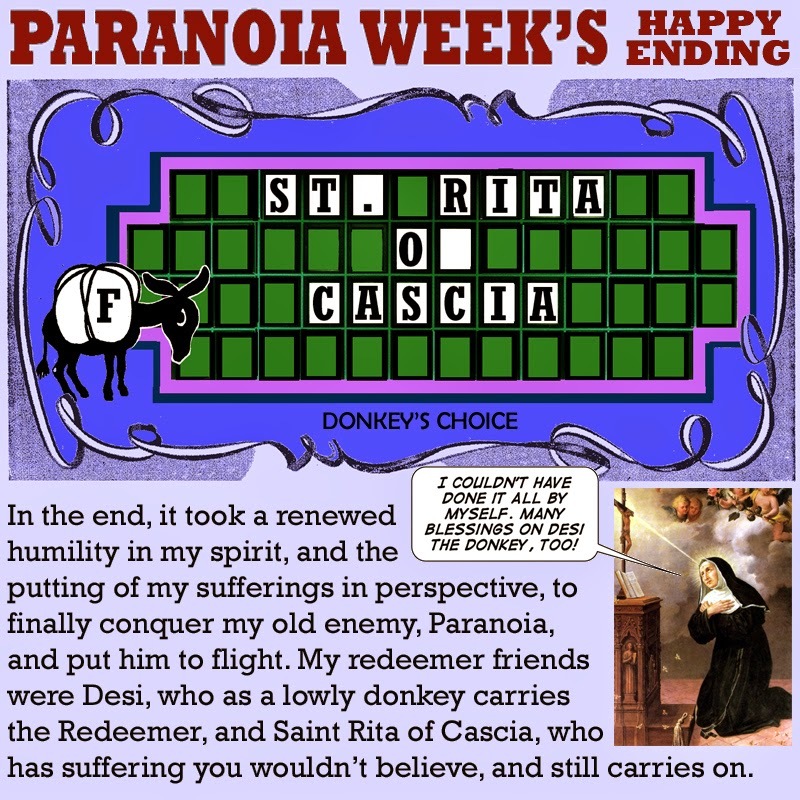 The Wheel of Fortune image above is a tribute to the Redeemer figures, St. Rita of Cascia, spelled out, and Desi the Donkey, going back and forth across the stage, in Vanna's stead, lighting the letters. Of course it's a great thing to always have the sense that you're not in it alone. Applying to everything in life, really. You have friends and family. And you have the values you grew up with, and the things you've believed with all your heart. Then, let's say, Paranoia strikes! Like I said, the things manifested in Paranoia were challenging, almost knocking me for a loop. But because of my grounding, what I believe, etc., there was so much within me that welled up to help. Like friendly bacteria taking on evil bacteria, antibodies taking on corpuscle invaders, or a hedgerow of warring angels taking on myriad imps, arms linked, from the pits of hell. Now, what would really do me the most good in life, probably, would be to quit wasting my time everyday, and really buckle down. I'm getting old, and like Dr. Pink said, my Vigor Vivus levels are currently piss poor. I seriously should be working on that. Then I might be able to stave off Paranoia when next he comes to call, driving him from my door. That'd be great! And another thing, which would also add to Vigor Vivus, I'd love to wear a long mysterious robe, have a nice thick candle, and a castle room with a heavy wooden table, and walls lined with wise books each 18 inches tall and 5 inches thick. Can't you picture me, hunched over a book, my mysterious shadow looking very cool flickering against the wall, reading and chanting till all hours? On the other hand, I'm reminded how St. Rita of Cascia had only a small oratory, and yet found great grounding from her spiritual experience in that small place. She said, "My dear sisters: if you wish to have the esteem and confidence of the good and virtuous, have little or no love for temporal riches. Observe strictly your vow of poverty. A nun who wishes to belong entirely to God must be totally detached from all earthly things." Then there's Desi, brought up as he was in a tiny stall, but when the time came carried the Redeemer. Or Dr. Pink, although I don't know how it was for him. Probably played with beakers in his dad's lab. Last but not least, there's some other "saints" I want to recognize. And that's my dear readers, among whom I have a special cadre of very faithful ones. Through this week they were in constant contact with me, writing me encouraging emails, commenting on the blog, and one, Lizette, even sent flowers! When you're in the grip of Paranoia, you don't know how much that helps! I am blessed. Of course they know who they are, but let me list them: Lizette, again, Azalia, Jerome, Zelda, Stephen, and Fitzjames, who I sometimes call, "He of the funky name," just teasing!